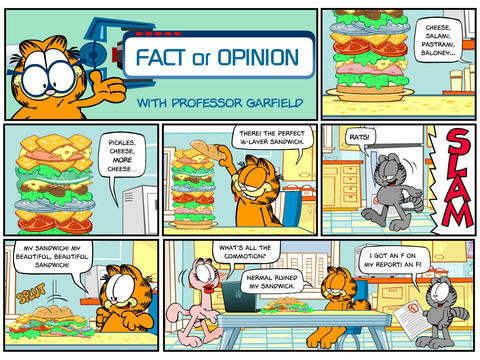 This week fourth graders had a lesson on distinguishing fact from opinion and we really enjoyed using the app “Professor Garfield Fact or Opinion.” I projected it on the TV and read it aloud, then we did the activities as a group. This humorous approach was a big hit with the fourth graders and gave them a good foundation for evaluating materials, particularly websites, as to their suitability for research purposes. 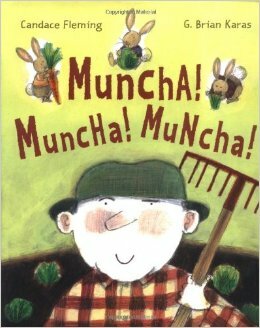 Also in the Library this week..
Kindergarten–In Muncha, Muncha, Muncha by Candace Fleming, poor Mr. McGreely finally plants his vegetable garden and then some little (adorable) rabbits make short work of it. This is a wonderful book to introduce prepositions as each page talks of all the ways the bunnies get over, under, and through all the attempts of Mr. McGreely to keep them away from his veggies. In the end, the bunnies still win and there’s a nice little message about sharing and compromise. First Grade–First graders had a field trip to Lake Cachuma this week. 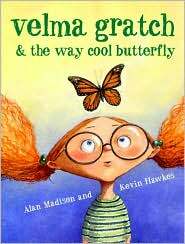 Second Grade–Using the Visible Thinking Routine called Before and After, second graders looked at an illustration from Velma Gratch and the Way Cool Butterfly by Alan Madison that I projected on the TV. They observed all the details and then thought about what could have happened one minute before the illustration and one minutes after. This is the charming story of a little girl who tries to distinguish herself from her older sisters in a series of humorous ways. It’s also filled with alliteration and it was fun for students to spot all the examples. Third Grade–Third Grade was on a field trip this week the the SB County Bowl for a performance. Fifth Grade–After looking at an historical photo of four men in the huge bathtub allegedly put into the White House, students tried to figure out what it was and what it could mean. 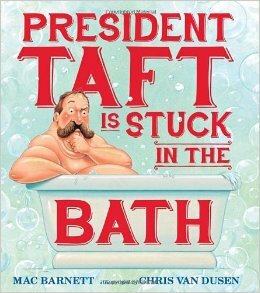 Then we read President Taft Is Stuck In The Bath written by Mac Barnett and wonderfully illustrated by Chris Van Dusen. Not only was this a funny story, but it gave us a chance to discuss what a legend is and how difficult it can be to prove historical events prior to the internet. This also gave us an opportunity to discuss the three branches of our government as in the story President Taft calls on all of them to solve his dilemma. This is a great read aloud for older students! Sixth grade–Sixth graders were challenged this week to use their knowledge of non-fiction text features. With a worksheet they had to take a non-fiction book and find sentences that supported several of the features.